Since the Mid-Autumn Festival is dawning upon us; the clearest hint being carts and stalls loaded with (over-priced) mooncakes in shopping malls, restaurants and practically invading every single corner of the street. Seriously. Go to any night market (pasar malam, for the uninitiated) and bear witness to branded and non-branded mooncakes being sold in the open. But, you’re on Motormouth From Ipoh. You know I never really bothered to write about the umpteenth piece of over-rated mooncakes from the big names in the industry. 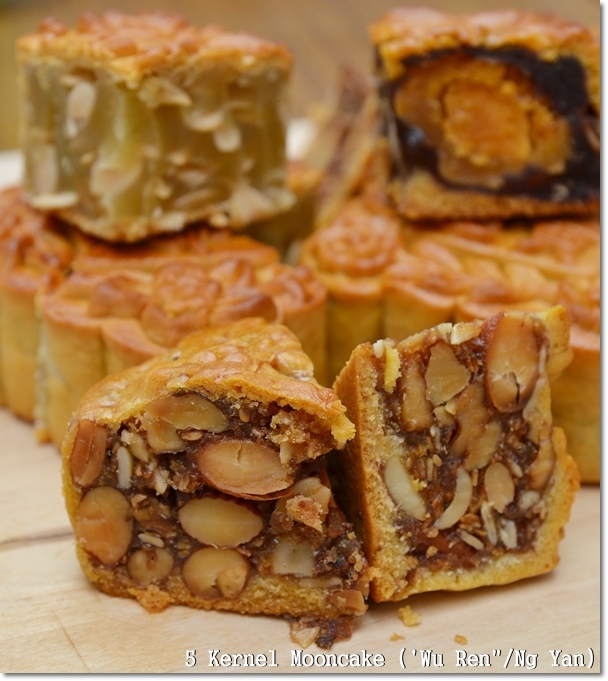 Year in, year out we hear of new creations/fusions of mooncakes swaying far from the conventional “lin yung” (lotus paste) and “tau sar” (red bean paste). Wanna read about Ming Yue; a name possibly not known outside of Ipoh but creating ripples and waves in the neighbourhood? Imagine every piece at less than RM7 each (yes! ), made in-house and baked freshly every day. 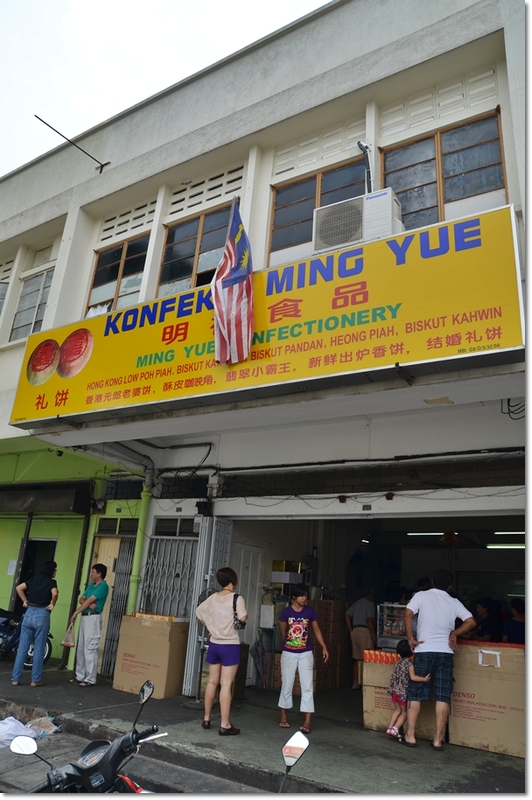 Now, I admit that I had never heard about Ming Yue being a household name in the mooncake chaos/scramble in Ipoh. Go to any mall and find Foh San, Tai Thong, Kam Lun Tai, Casahana & Baker’s Cottage fighting tooth and nails for your attention. Or you parting ways with your hard-earned cash ($$$). Then being one with a slight rebellious nature, I concentrated on reviews covering Teochew mooncakes from Ching Han Guan and cempedak mooncake (fabulous stuff!) from Hoong Tho. This year, Ming Yue Confectionery stole the limelight. 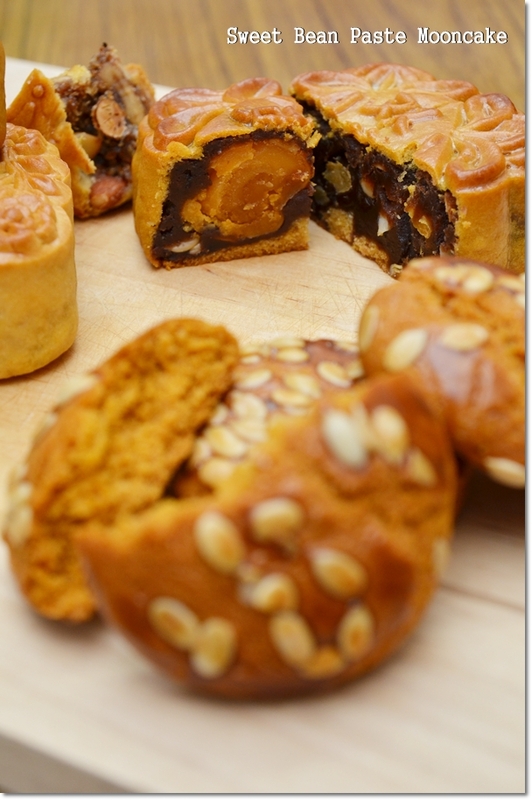 Jason threw a hint initially; after tasting mooncakes from Ipoh brought by his colleagues in a frenzy. Literally. Unbeknownst to me, my family was already immersed in the craze. Suddenly, the name Ming Yue popped up in conversations after curious inquisitions from yours truly on the oddly all square-shaped mooncakes on the table bearing no brand. And hence, Mum said how exclusive the mooncakes from this old school confectionery in Pasir Pinji is. You MUST call in advance to reserve your choice mooncakes, unless you don’t mind pushing your luck and line up for whatever that comes your way. Usually, the white lotus paste and red bean paste will be available at all times. But say, if you want to try their signature “5 Yan” (five kernel, or mixed nuts) variety, or their most exclusive “Foh Tui” (Chinese ham) version, then you would do best by calling a day in advance. The latter usually are baked in batches after 5-6pm, hence you can imagine the snaking queue at that moment! Which begs the question, are these worth the journey all the way to Pasir Pinji for? I personally felt that the key selling point has to be the incredibly low price. A box of four’s will only set you back at around RM25/USD8 or so. While most famous names will definitely be priced at double or even triple the price! Tastewise, the white lotus paste mooncake which is literally loaded with “kuaci” had this very clean flavour and thankfully sweetness level that was bearable and not overwhelming. The red bean paste was okay, though I admit that I was never a fan of “Tou Sar” filling in the first place. Kudos to the Five Kernel (5 Yan) version loaded with nuts and sweets with candied winter melon bonding the crunchy bits together. The soft filling was easy to chew on and the sweetness was tampered to a level that even Grandma could agree upon. Maybe this will not create a buzz like Ching Han Guan’s mooncakes that you can barely find elsewhere. Or you prefer the funkier items churned out by the hotels or restaurants. But judging from the locals’ response and enthusiasm, evidently …. 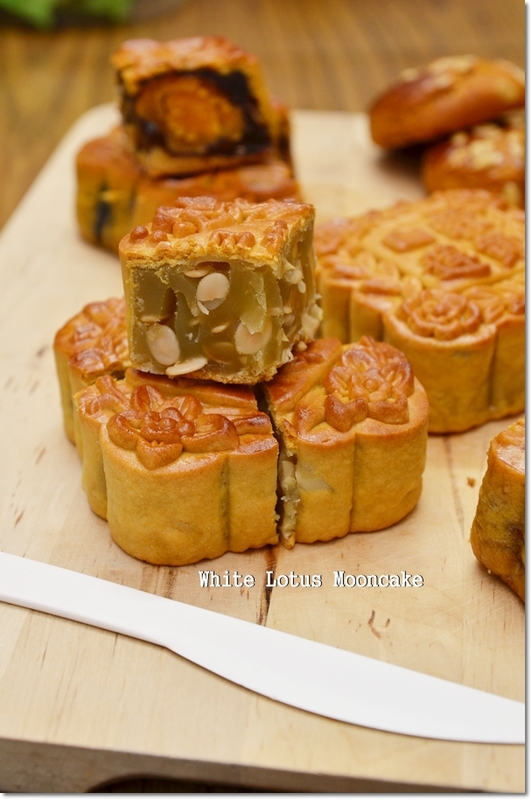 A piece of quality mooncake at a reasonable price. Directions : Directly facing Tuck Kee Restaurant in Pasir Pinji; and within walking distance from the famous Big Tree Foot Yong Tau Foo. 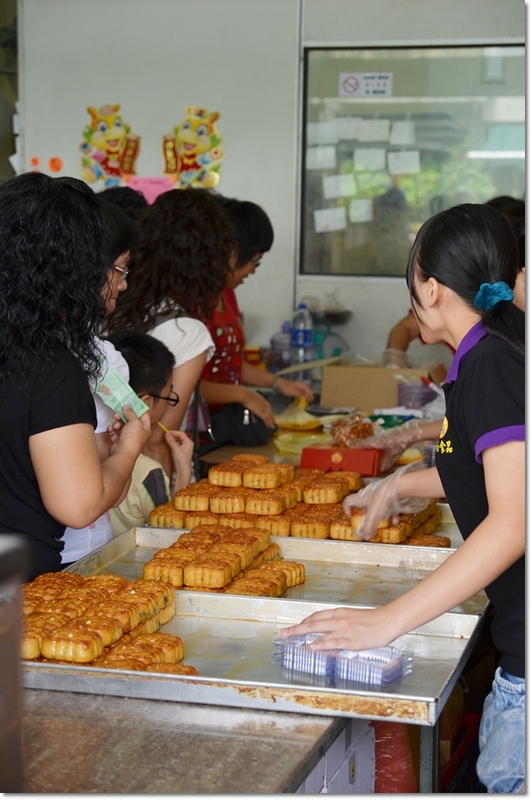 On usual days, they sell various biscuits like kaya puffs, wife’s biscuits (lou por peng), heong peng, etc. This is another “must go” place in Ipoh Pasir Pinji. 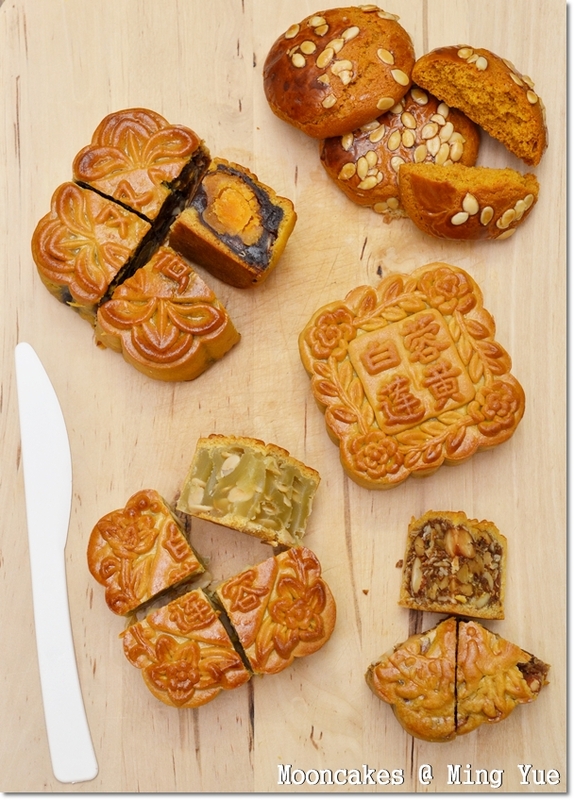 How would one rate (generally) the taste of these mooncakes, say over a scale of 10? Anybody? Thanks. 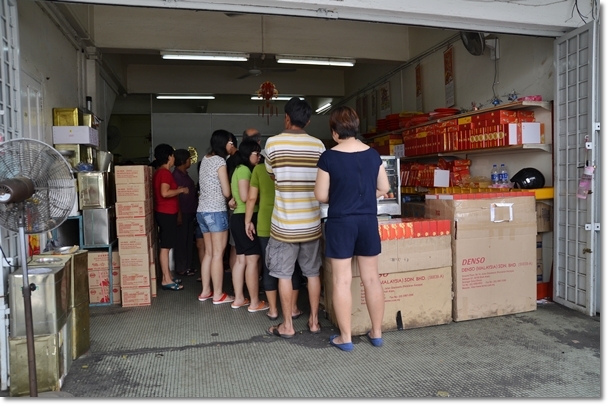 There are always a long queue at this confectionery shop near mooncake festival. They only allow a few pieces per person. Their mooncakes are nice with lots of kuaci and at a very reasonable price. I like their white lotus. Sometimes when the queue is unbearably long you can’t even got to choose what you want as you can only buy what they baked out at the time of your queue. Tips : his brother’s shop is not very far this place. Taste good too and best of all NO CROWD! Yes, you can buy from this place in 10 seconds flat and you can choose anything you want! Hint : near the sago ice stall in Pasir Pinji. Yes, Tham. I know where. I think near to Sun Poh Poh restaurant, and the Poh Lee fried chicken stall right? Yeah, and I hope you like them!